- Remember to charge your Rotax battery and your transponder battery. - Load all your stuff the night before or the morning of the raceday. - Make sure you have: helmet, gloves, driving suit, high top shoes, jerry fuel can, mixing fuel can, Motul oil, chain lube, kart stand, FM Radio for announcements, tent(optional), appropriate tools (10mm, 13mm spanner and the same in sockets and extensions),(4,5,6,8mm allen wrenches) & a (spark plug wrench) usually any specialty tools can be borrowed at the track. - Find an unreserved parking spot for your pit space if you do not have a reserved pit spot. - Remember to secure your tent from wind gusts. - If you need help unloading your kart, ask someone to help, we are a friendly bunch and are always willing to help new people. 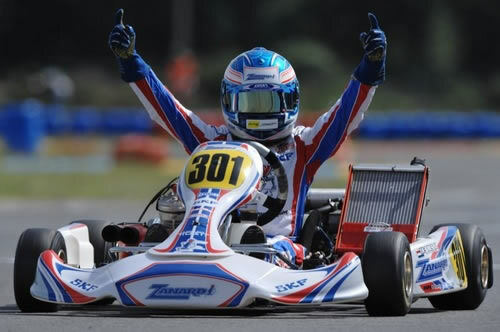 - If you race Rotax, mix your fuel. Again if this is a new thing for you, ask for help as this can be an expensive mistake. - If you race Briggs, make sure you have put the appropriate amount of oil in the crankcase. - If you still have time before the driver's meeting, go through the kart and check that everything is tight. Wheels, hubs, steering components, brake components bumpers and floorpan. - If you still have some spare time, have a walk around the pits and introduce yourself and/or help others unload or set-up their tents. - Driver's meeting will cover the days activities, any club news and any safety issues. - Figure out who is in your class and keep an ear out for when you are called to the grid and/or watch for that other person in your class leaving for the grid. - Take it easy for the first one or two laps. If you are not going racing speed, drive with your hand in the air to indicate that you are not going racing speed and maintain your line. The faster karts will see your hand signal and take evasive action. It is their job to get around you and they can see you better than you can see them. - Practice is not racing so don’t be a moving chicane. If someone is faster, let them by and learn their line. - If you are in a large grid(Briggs classes) it might be divided into odd race numbers and even race numbers. Be prepared to go in the right grouping. When all the karts in your group are let out, bring the tires up to temperature and then if you are following another kart, try and leave a gap so that you can do a flying lap without them slowing you down. If after your flying lap you have caught up to another kart, back off again and leave a gap so that you can take another flying lap. If you practice this, there is no reason to feel like you were stuck in traffic and couldn't get a clear lap. - You will be gridded according to your qualifying time. This is the time when you want to use all of your peripheral vision skills to avoid any contact in the first lap. - You will be gridded according to your finishing position in the Pre-Final. I believe we are using the same scoring system as last year where Qualifying, Pre-Final/Heats and Final all count for points, so consistency is important. Rule to live by: If you happen to spin out or get knocked backwards, KEEP YOUR FOOT ON THE BRAKE and do not roll backwards. The most unpredictable kart is the one rolling backwards and turning unexpectedly into oncoming traffic. A backwards sliding kart’s direction with the brakes on can be anticipated by the racers coming after the altercation. Save yourself and your fellow racers the collision damage by keeping your brakes on in this situation. Trophy presentation - support your fellow racers like you would like to be supported with your future success. I have had a passion for motorsports since I was a young boy and built racetracks with Mattels Sizzlers, Hot Wheels and Lego. At 14, I was introduced to karting and never looked back.